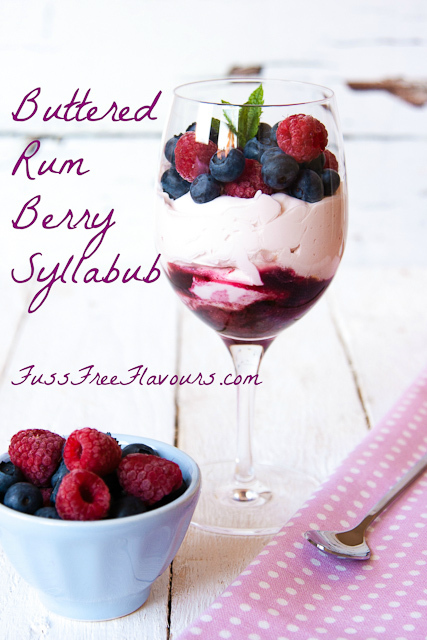 If you try this Recipe: Buttered Rum Berry Syllabub please tag #FussFreeFlavours on Instagram or Twitter. It is amazing for me when for me when you make one of my recipes and I really do love to see them. You can also share it on my Facebook page. Please pin this recipe to Pinterest too! Thanks for reading Fuss Free Flavours! This super simple pudding is sure to impress and is perfect for a romantic night in. 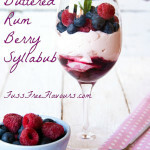 Make this Buttered Rum Berry Syllabub in a few easy steps! Put the butter, sugar and rum into a small pan and heat until melted. Add the berries and gently cook for a few minutes until the berries are soft, but still holding their shape and the liquid is syrupy. Remove from the heat and allow to cool. In a large bowl whisk the cream, sugar, juice and wine or champagne together until thickened, but still floppy. Divide the berry mixture between two glasses. Gently dollop the cream mixture over the meringue. I use a jam funnel to get it neatly into the glass. Smooth it down if needed. Top with the fresh berries, toasted almonds and a sprig of mint. Serve immediately, or keep in the fridge for a few hours before serving.